I am lead of a development team at work and love using inkdrop to take notes there and track my todo list. I am a student and have found that inkdrop really suits my needs for taking notes in class and studying later. I am co-owner of an LLC and use inkdrop for my own notes there as well as other dev projects on the side. I have an individual notebook with an underlying hierarchy of subnotebooks for each of these use cases, but things like tags and statuses cross over to all notebooks. It would be nice if I could have completely separate “workspaces” so that for example when I am at University I see all the tags and todo items related to my classes, but I don’t see them while I’m trying to run meetings with my team at work. Is there a way to do this without purchasing a unique subscription to inkdrop for every use case? Create multiple “workspaces” that contain notebooks, subnotebooks, tags, statuses, etc… and provide a way to switch between them. Allow scoping tags/statuses by the top level notebook that is selected. I realize this is a large request that would require quite the refactor, but I’m curious to hear thoughts. I can’t be the only one who wants to integrate inkdrop into every part of my life! haha. Great to hear that you use Inkdrop for your various project! Yeah, supporting multiple workspaces would be great for people like you. As you guess, that’s right, it would however require fundamental changes to the app. I understand your need, but personally I don’t need more workspaces at the moment. I use the app everyday as a heavy user. That’s the big reason the app has been able to keep stable, simple and clean so far. I don’t feel like adding features that I don’t use. Because I can’t notice bugs and fix them quickly. In theory it is possible but I’m afraid to say no at the moment. When I had several projects and had a problem like this, I would be happy to consider it in the future! Just my 2 cents on the topic - I also use InkDrop for different “workspaces” right now. Because you can nest notebooks however deep you want, I just use some top-level notebooks as “workspace”, and only expand the one I’m using. Thank you for the comment Samantha, but unfortunately this doesn’t solve my problem. I already use the top level notebooks as each workspace and number my notebooks when order is important. However, my concern is with the tags and todo lists. For example, I like to tag various notes I take in university based on topic. That way I can return to notes from previous classes that relate to the current lecture. I also like to tag notes at work based on various projects or goals. I do the same for my projects at home. I’d say that each group/workspace/top level notebook has a reasonable amount of tags, but with no way to scope the tags, I end up with a big list of all these groups of tags mixed up together. 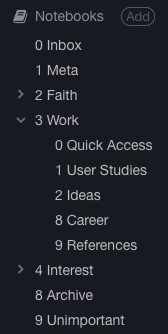 I have the same issue with todo list items. For now I will try numbering all tags with the same number as my notebooks. At least that way they won’t be mixed up even if they are all visible at once.